This is the first test shot of me in my mask. Overall I think it turned out quite well. As you can see I still need to set the hair into a permanent style. 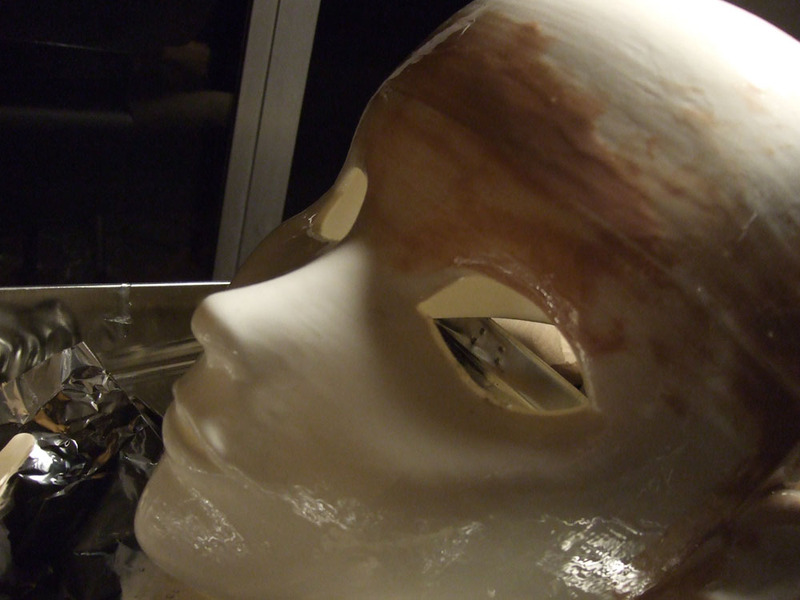 The joints have been smoothed out with bondo, and the entire mask covered in xtc-3d epoxy. It sands well, but tends to pool up and makes the surface wavy, as if it has been covered in maple syrup. The mask has gone through about 3 rounds of sanding which took me about 4 hours. It's been primed and is ready to paint! not bad at all, well done! That's amazing!!!! I love it!!!! 3D print is definitely the most technological amazing thing i have seen. I thought I’d include some production details, and talk about some lessons learned. First off this was printed in PLA. Which was much less of an issue than I thought it would be. When I first got the mask together, I accidentally dropped it about 3 feet onto a hard tile floor. The mask bounced a few times, and came out unscathed. That said PLA does have a nasty habit of turning semi-solid at right around 140 F, so I don’t know how well it would transport. The biggest problems I had with PLA is that it’s hard to glue, and you can’t sand it. I tried a bunch of superglues on varies scrap parts. I’d let them cure overnight and then see if I could pull them apart. Even the highly touted Loctite super gel came right apart as soon as I’d put any force on it at all. I ended up using a combination of solvent cement and plastic welding. Acrylic Solvent cement dissolves PLA, you push the partially dissolved pieces together and let the solvent dissipate for anywhere from 24 to 72 hours later, and voilà! They are magically joined like a single solid piece. Only not voilà, it’s actually kind of a pain to get it to work. First off you can’t just apply a little to the edges and expect it to work. I had to use the “soak” method which means pouring solvent onto a baking sheet and sitting the parts on the sheet so that the bottom few millimeters soak it up for a minute before pressing them together (for about 30 seconds) and then letting them dry for a minimum of 24 hours. The first time I tried this I tried to do too much (my mask was in 7 pieces), and it didn’t go well. I’d do one joint, only to have it slide off when I tried to do the next. And the pieces have to sit absolutely flat against one another to have any hope of working. I went back and recut the model into just 3 big pieces. So I’d only need to do 2 joints. This worked pretty well, but I still ended up with gaps in the joints that I needed to weld with a soldering iron. I couldn’t plastic weld the whole mask because, A) it makes ugly seams, and B) it only welds the surface, so it’s good for touch up, but wouldn’t work for everything. 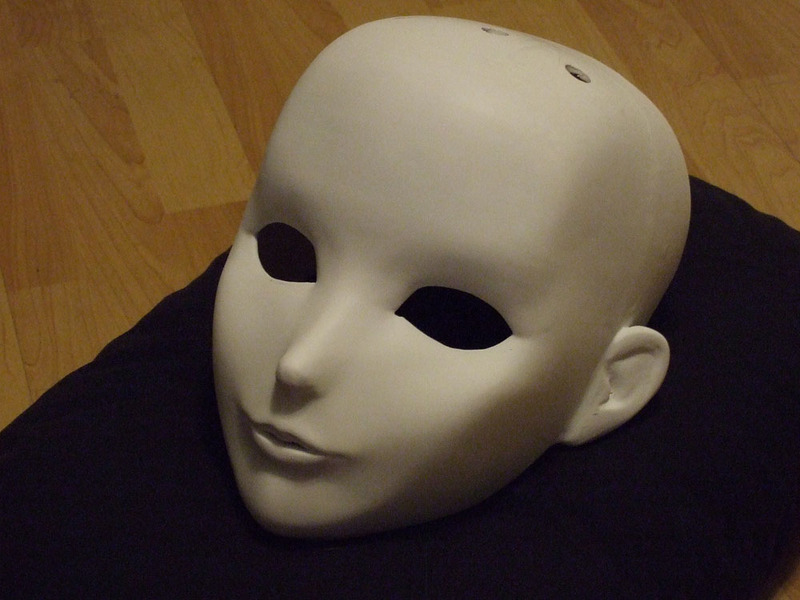 A better way to do it, would be to get a larger 3d printer (or use shapeways), and then print out the whole mask as either as single piece, or at least get it down to two pieces with the seam in an out of the way spot. So let’s talk about 3d printers for a second. I bought a Hictop diy kit, mainly for the large build volume (27cmx21cmx18cm). It was sort of a pain to build my own, it took a while and I got a lot of bad parts, and other issues I had to work around. Another big issue is that on most 3d printers, the build plate moves back and forth with the y translation. This usually isn’t an issue, but for a section kigurumi that might weight as much as a pound, that’s a lot of mass vibrating, so the build quality gets worse and worse as the part prints and gains mass. I’d have been much better off with a printer that moves the print head for the y-axis instead. Unfortunately, that’s almost only used in enclosed semi-professional models that cost around two to three thousand dollars. However, I have recently spotted what I think to be the perfect mask printer. The hatchbox alpha is a large “delta” style printer(the model stays stationary during the print), that prints in a 300mm diameter wide cylinder (330mm tall). It’s $800, so it’s not super cheap, but it’s whole lot better than a couple grand. But with that build volume you could print an entire mask in one go. (although you’d probably still want to print the top of the head separately. Okay the next step was getting rid of the layer lines. Since you can’t sand PLA, you have to coat it with something, and then sand that. I ended up coating the entire mask with xtc-3d epoxy, which was highly recommended. I consider this to be a mistake. 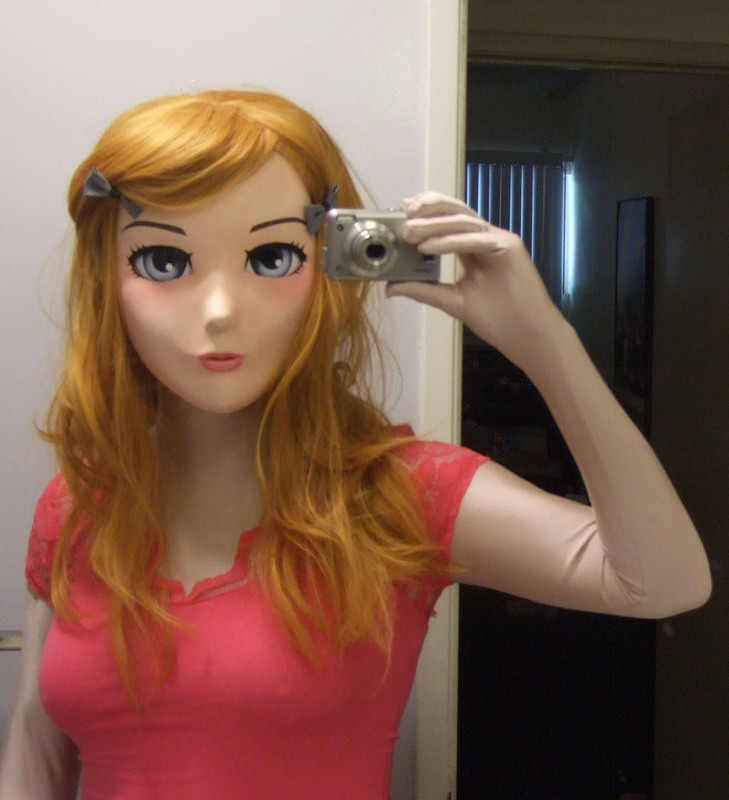 The problem is that xtc-3d is designed for small, highly detailed models, and most kig masks and large and smooth. It ended up looking like I’d coated the whole thing in maple syrup. And I had to spent 4 to 6 hours sanding it down. 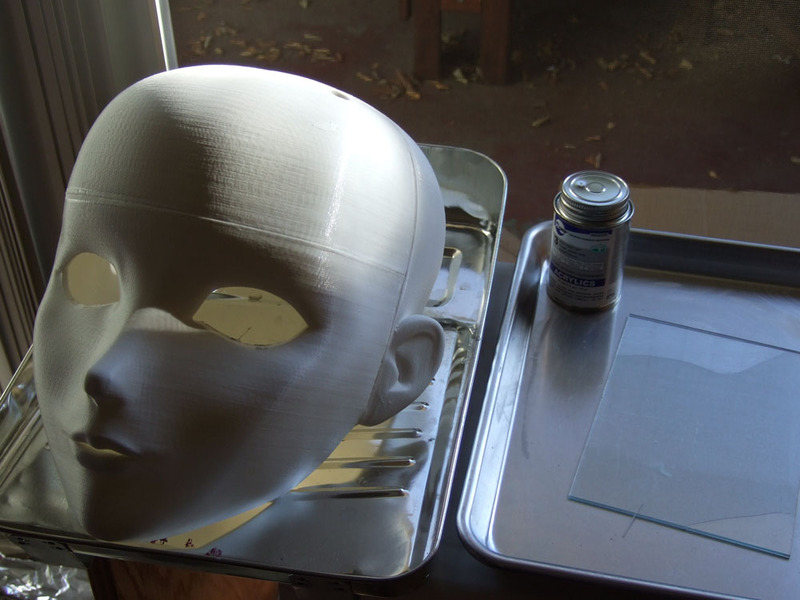 Also xtc-3d is transparent so it won’t show flaws until it’s painted, meaning you have to spray the mask with primer before you sand it. A better solution would be to use filler primer, which sprays on and is designed for smoothed surfaced auto-bodies. The only issue here is that it takes a bunch of coats to smooth out a model printed with .3mm layers. So if I did this, I’d plan to print at .15mm layers (which gives the layer lines only ¼ as deep as .3mm layers). It should be easier to sand. After that I came to painting the mask. I made the mistake of trying to use some semi-gloss house paint, thankfully I tried it out on a test piece first. It looks really nice, good color, went on smooth, dried hard, but unfortunately, house paint is designed to protect walls against just about everything, including other paint. Bottom line, nothing will stick to semi-gloss house paint. I ended up using flat acrylic paint I bought at Michael’s. I used the “craftsmart” brand (1 part coral, 2 parts soft pink, one part white, for a pink flesh color). I airbrushed this on using a cheapo “master” brand compressor and brush, which worked fine. (thin the acrylic paint with an equal measure of blue Windex to make it airbrush-able). The second problem is easier to solve. I used polarized sunglasses. However, the mask angles them differently than the frames, which caused the middle third of the vision cone to be blue. So just don’t use polarized lenses (and they don’t need to be nearly as dark as the ones I used), and everything should work out. After that, I attached two wigs using Wyu’s method. The only issue here was that I bought curly wigs which tangle constantly. The only other issue was that the mask didn’t go down far enough in back so it would pop off if I looked down. But an elastic strap seems to have fixed that issue. Anywho… it was fun, but it was also way more work than I was prepared to do, so it’ll be a while until I make another(I’d want a better printer like a Hatchbox alpha first). If enough people are interested in the mask, I may make it available to print on Shapeways (be prepared to spend $500 for the bare plastic alone.) I’d also be interested in partnering with a professional mask builder if anyone is interested in that. I’ll also look into replicating the venting system of fog-free goggles. My ultimate goal would be to make a mask that can be worn comfortably all day at a convention, or other event. Granted this is an overly complicated design, and probably impossible to print very well, but you get the idea. The big groove fits together snug enough to not show a gap. The locking design should handle most of the stress on the joint, meaning the glue has a much smaller chance of giving way. The additional piece beyond that will have enough of a gap between each side that glue will be able to fill it in, and the ridged design gives more surface area for the glue to hold, as well as handle more stress on the joint. If you want to go all out you could even slightly taper the piece that fits into the groove outward, and vice versa for the groove itself. This would make a snap-together joint, which might even work without glue at all! EDIT: Better yet, just make small tabs with screw holes every couple inches along the joint, at right angles. Then screw them together and you have a sure-fire bond. Only problem would be they cut into the interior area of the mask, so might not work in some areas. Also, the tabs would be of limited strength due to their size. And who said you can't sand PLA? I've done it before, albeit just to reduce friction on moving parts (not so worried about surface quality as much as removing the layer lines) and on flat surfaces. You just gotta sand at a slower pace, as if you go too fast (or use a sander) you might make the plastic hit its melting point. Post was edited 3 times, last by “KineticIsEpic” ( Jul 19th 2016, 10:42am ). Where do you travel that 140 degrees Fahrenheit would be a problem? Perhaps a car on a hot, sunny day. Especially one with dark leather interior. A mechanical joint might work, but right now I'm slicing the model with netfab basic so I'd need to do it in Blender if I wanted to do that. I'd really like to get the process for the mask simplified. A single solid print is very appealing. The more work I can put on the printer the happier I'll be. If I could eliminate the joining process and get the sanding process down to a few hours, I would only need to spend maybe 8 hours putting a mask together. Yes, you can sand PLA a little, but I'd be worried about sanding through to the fill, because I'm only printing with a .8mm wall. (The mask averages 2.7mm thick). And actually it's nice that PLA is so hard to sand because you don't really need to worry about over sanding. Anyway I expect I'll get a new printer before the end of the year, and will start on new mask then. FYI I had to do a bit of a tear down on the mask, I noticed a bit of wear on the nose and decided to coat the whole thing in polyurethane. I did a bunch of coats in gloss, because that'll make it very tough, and then I'll lay down a matte top coat over that. I definitely recommend this as acrylic sealer didn't seem to be up to the task. well glues work by melting plastic, so stuff you used was pain. But then ALL diy-projects hit these speed-bumbs. But now you have unique mask, and self-made at that! @gailblue, that looks amazing! Are you planning on selling any?